My practice stems from the relationship humans have with nature. Humans have used and adapted nature for their own uses for as long as they have been on the planet and to me it seemed like it was time the nature reclaimed what was theirs in a destructive and aggressive way, making the plants used in my work seem self-aware. 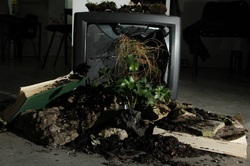 Through sculpture and installation, my work shows the plants own liberation and reclaiming the natural objects humans have manipulated for their own uses, while destroying the objects humans have close relationships with such as books full of personal words and life changing knowledge. I use materials related to myself to create the idea nature is destroying a physical history of my life. I show the themes of human fragility through the destruction of familiar and personal objects and possessions within my work. Nature is a constant throughout the world’s history, where as humans are almost temporary in comparison. I show this through the plant’s actions of breaking though and taking over objects made from natural resources.